Their actions may have saved further casualties, as Tarrant was apprehended by two armed police officers not far from Linwood mosque soon afterwards, while driving his vehicle with a visibly smashed back window. People in New Zealand and beyond are praising a man for chasing away the gunman during Friday's deadly mass shooting in Christchurch. Through the window Alabi sees a man with a helmet, military clothing and a gun. Then he saw two bodies and "realised this is something else". "This is a killer", Alabi said and shouted at the congregation of more than 80 people to get down. He said the extremist had thought that he would fire on him, that was why, he ran away. "He went after him, and he managed to overpower him, and that's how we were saved", Alabi told Associated Press. He added that if the shooter had managed to enter the mosque all of the worshippers would probably have been killed. "If you see something happening that is not good for other humans, or if that is hurting other people, you give your everything to save them, even if it means giving your life", Rizwan said. The woman, identified as Marie Fitzgerald, said: "It's just so much for everything to take in that somebody in our family would do anything like this". "They just want to express the anxiety and the pain they are going through ... that's all". "That doesn't mean there weren't possibly other people in support and that continues to form a very, very important part of our investigation". "When I was ducking between the cars I could hear my two boys were saying, "Daddy please come back inside, please come back inside", I told them "you guys hold out, I'll be alright". "We were praying, then we heard gunshots, I thought somebody was using firecrackers". "I will pray for them". Boztas added that outside the mosque he saw a young person on the ground. "Go down! Somebody has just shot our brothers outside the masjid". He said the gunman dropped his gun when he ran out of bullets. Aziz is convinced that "God was to die, that's it for me now is not the time". 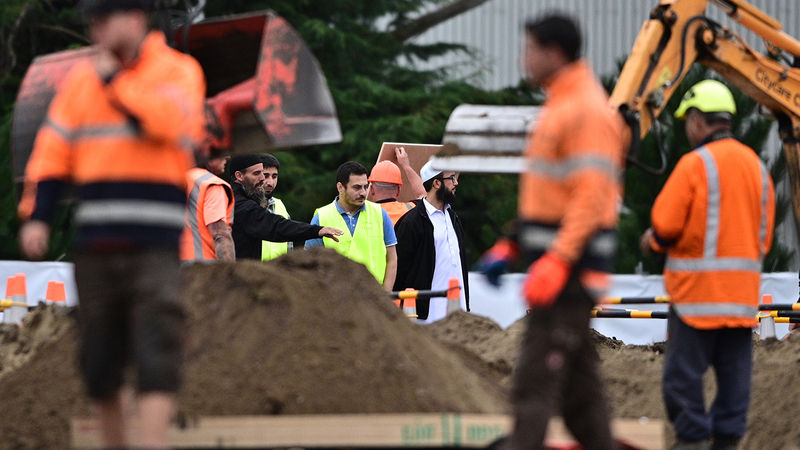 A man pays his respects at a memorial site for victims of the mosque shootings at the Botanic Gardens in Christchurch. "I started picking up the bodies to know who was dead and who was alive". Amid the mourning and outrage over the horrific attack, New Zealand's prime minister is pushing to implement strict gun control laws similar to those imposed in Australia. "She was screaming "come this way, hurry up", and she took many children and ladies towards a safe garden", husband Farid Ahmad said.